Our monthly selection includes an excerpt from a study and translation of a Japanese Buddhist classic on the concord between esoteric and exoteric ways, and how despite all the diversity of approaches to the Dharma, they all fundamentally arise from the utterance of A, and the saving method of the Buddha. Dohan suggests that the very in and out breath that sustains beings’ life is the true form of constant nembutsu recitation. 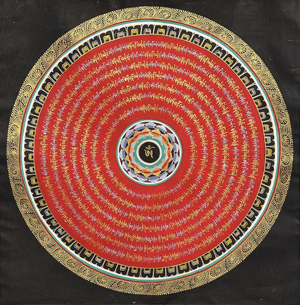 The breath is said to be the embodiment of Amitabha’s name. the true intellectual, al-‘aqil, is not simply one who knows a lot of things. The true intellectual is one whose knowledge of reality is sufused with divine mercy; from such a person, the light of knowledge will radiate as an almost tangible form of benevolent mercy, loving compassion. • An article on medieval Kabbalistic doctrines by Eitan P. Fishbane, “The Speech of Being, Voice of God,” speaks of Divinity represented as a cosmic act of articulation, a metaphysical progression of breath into sound. The divine speech approaches the kabbalist as the mysterium tremendum, at once with the allure of revelation and the terror of ultimate danger.